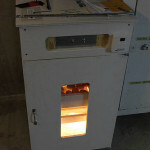 It’s been 8 days since the eggs went into the incubator, so it’s time to candle them. 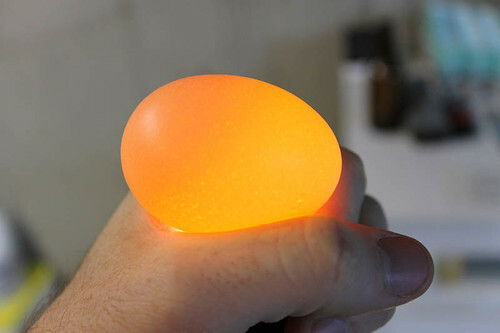 Candling is the process of holding the egg up to a very bright light to see if there is a chicken developing in there. The eggs that don’t have anything going on inside are called “clears” and are pulled out of the incubator. 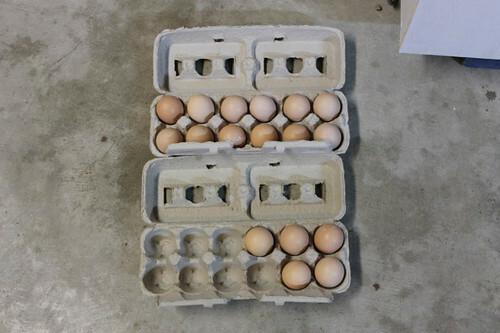 The rest of the eggs are put back, and in a little under two weeks, they ought to hatch. 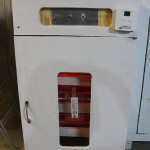 You can buy egg candlers that run from $10 up to several hundred dollars, or you can make your own. Being the frugal, DIY type, I prefer making my own. Of course, I haven’t made my own, because I have something that works just as well: a LED flashlight. First, make good and sure that all the lights are off in the room you’re candling in. Next, I make a circle with my thumb and index finger and hold the flashlight with my remaining fingers. Put an egg on the circle you’ve made, and you’ve got an egg candler. Here’s what a “clear” egg looks like. They have a tendency to glow really brightly when you shine the light through them. There are no dark spots or lines in the egg at all, except for a slightly darker area of the yolk. 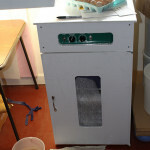 If I’m in doubt about weither an egg is really clear or not, I leave it in the incubator. I’ve had no problems leaving clears in for the full 3 weeks. I’ve never had one explode or go rotten at all. In fact, when I’ve pulled 3 week old clears out of the incubator, I’ve gone outside and smashed them without any stinkyness at all. So go ahead, be a bit lazy about candling and pulling clears out, it likely won’t hurt anything. If you candle a few days before hatching it’s much easier. The good eggs will be completely dark except for the air pocket at the big end, and the bad eggs will be either completely clear, or some degree of translucent. Here is a good egg. Notice that it’s much darker than the clear, and if you look closely you can see the dark lines seperating the embryo from the “white” of the egg. It’s pretty hard to take a good photo of an egg being candled, but a good egg will almost always have small dark spot with small dark “veins” radiating out from it. If I see anything at all resembling dark lines, I assume it’s good and put it back in the incubator. 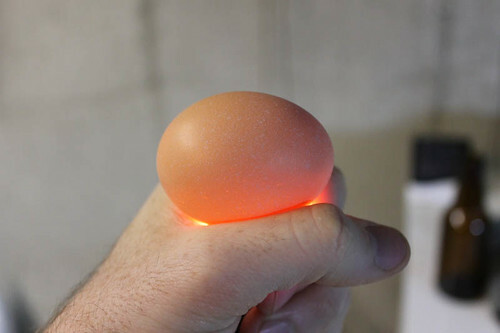 There can be dark circular lines or rings in a bad egg due to bacteria, but I try to candle the eggs pretty quickly to get them back in the warm incubator. If there’s a bad egg in there, it can wait till later to be found and pulled out. 128 eggs incubated, 17 clears so far. 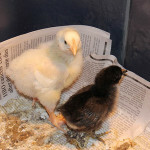 We will potentially have 111 chicks in two more weeks! Our problem with clears is definitely resolving itself. I think that it was probably due to my relatively young and inexperienced rooster. Earlier in the year he was having trouble mounting the hens. At times he would lose his balance and fall off face-first over the hen. We haven’t seen him doing that at all this spring, so he seems to be doing a better job. 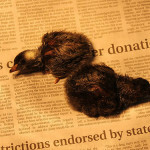 Tags: Chickens, eggs, Incubator, Second time's a charm?